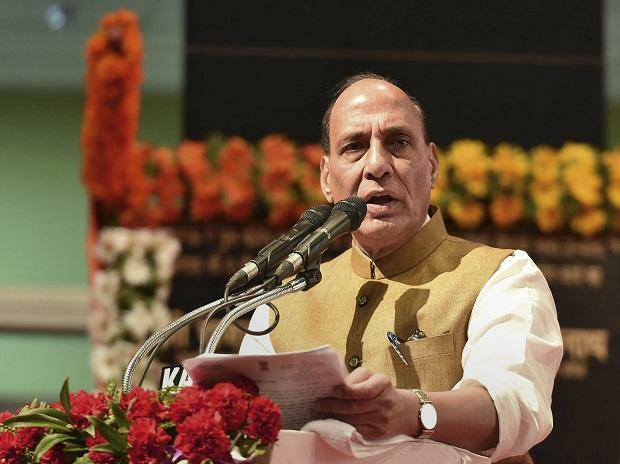 India has carried out three cross border strikes in the last five years, Union Home Minister Rajnath Singh said here Saturday. Singh spoke about the 2016 surgical strike after the Uri terror attack and the air strike after the Pulwama incident in which a CRPF convoy was attacked by a suicide bomber killing 40 jawans, but he did not reveal about the third. "I want to tell you, brothers and sisters, that in the last five years, we have gone beyond our borders thrice and our men have successfully conducted airstrikes. "About two I will tell you, but won't tell you about the third one," Singh told BJP's Shakti Kendra office bearers convention here. "One time you saw in Uri, terrorists who came from Pakistan killed 17 of our soldiers, who were sleeping at night in a cowardly attack. After that, our soldiers also decided. Whatever happened after that you too know it very well, I need not tell....now you are seeing. First attack happened. the second one was air strike... happened after Pulwama attack. I won't give you information about the third one," Singh said without elaborating. Singh asserted that "it is no more a weak India." "...leaving aside all our differences, we have to stand together. Time and again India has done this." In a pinpointed and swift airstrike on February 26, India pounded Jaish-e-Mohammed's biggest training camp in Pakistan in a pre-dawn operation, described as "non-military" and "preemptive". Indian troops had crossed the Line of Control in September 2016 and launched a surgical strike on terror launch pads in Pakistan-occupied Kashmir after Pakistani terrorists attacked the Uri army base in Kashmir, killing 19 soldiers. Singh said the Indian government had given a strong message to Pakistan after the Pulwama attack. He also said that Pakistan would have to pay a huge price if it continued to promote terrorism. "The country will not provoke anyone, but will not leave anyone if provoked," he said. He also said that no force in the country could deter the BJP from its fight against terrorism and the party would come back to power at the Centre with renewed force. Singh said the BJP had risen to heights from a party having only two seats in Parliament way back in the eighties. It could attain a clear majority in the 2014 elections. Singh also said that India would become one of the top three nations in the world in the next 10 years. "America, Russia and China are now the top three powerful countries. India will join the league of top three by the year 2028," he said. Stating that BJP was the largest political party in the world with its membership strength, Singh said India could retaliate against the terrorist strikes only because a strong party was in power. The country has become one of the fastest growing economies in the world in recent years, he said. He said state governments and party units in states had been asked to protect Kashmiri students studying at various institutions in the country from attacks after the Pulwama terror strike. Singh expressed the hope that the BJP would win all the 28 Lok Sabha seats in Karnataka. The Congress-JD(S) coalition is weak in the state and has not been successful in delivering its promises, he said. BJP state president B S Yeddyurappa, Nalin Kumar Kateel, Shobha Karandlaje MPs and other leaders were present.